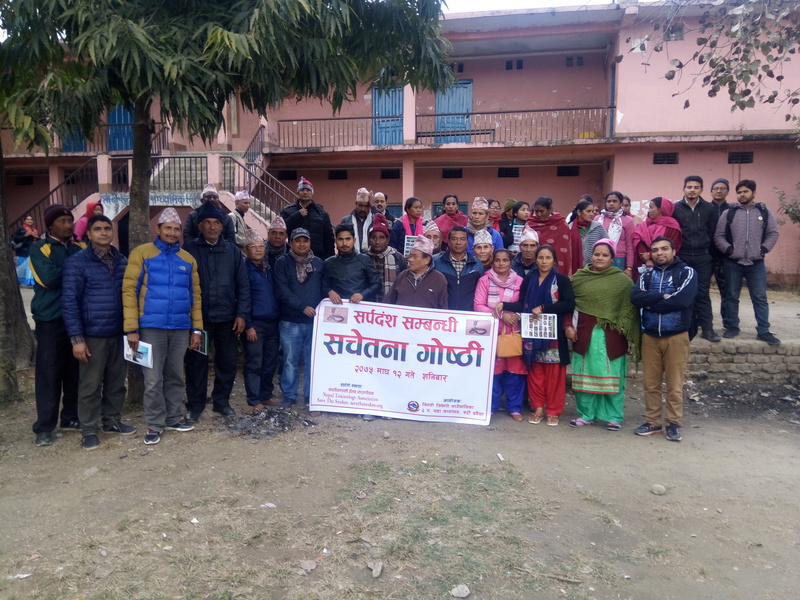 A successful snake conservation workshop was held at Vinay Triveni VDC, Sardi, Bagaicha on the 26th of January 2019. The workshop was organized by Sardi, Bagaicha, Ward no. 3 at Dipendra HSS. Eighty-five people were present at the workshop including local leaders, teachers, students, farmers and other community members. Dr. Chhabilal Thapa, President of Nepal Toxinology Association provided his knowledge on snakebite management and conservation biologist, Mr. Kamal Devkota, gave a presentation on “Snakes and their conservation”. He also introduced Save The Snakes and our work to the community people. The program was conducted with the help of local community members. People from these areas of Nepal have been confronting snakebite for many years with many lives being lost to snakebite. A few years ago, the local people killed a king cobra due to the fear and lack of knowledge on snake species. This year’s workshop was held before the snakes came out of their hibernation period to reduce the number of snakes killed.